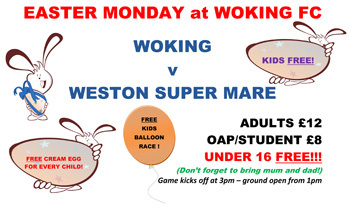 WOKING Football Club are opening up the doors to juniors in the area with a free admission initiative for the game with Weston Super Mare on Easter Monday. The club’s final scheduled home league game of the season (barring the play-offs) will see youngsters let in for free on the day and a number of activities will be in place to make it a junior friendly atmosphere. Every junior coming through the gates will get a free cream egg upon entry and the chance to take part in a balloon race which will be released on the day. There will be prizes for the longest travelling balloon. All the schools in the area will be notified in the coming weeks as we try and get a bumper crowd with the kids encouraged to bring mum and dad along too! Why not download the poster and print it off and help us with our promotion? So spread the word for this Easter Eggstravaganza!